This is the full version of Disc Gunship, compared to the 'mini' version posted previously. It is about twice as long, and features new locations, traps, and a boss. Influence from Darius II is also much more prominent in this version. This is a conflation of my previous games Gravity Gunner and Disc Gunner. Apart from using the famous Super Crate Box weapon, this is also inspired thematically by R-Type III and They Came From Verminest. This is a conflation of my previous games, Gravity Gunner and Disc Gunner. Apart from using a weapon from Super Crate Box, this is also inspired thematically by R-Type III and, to a lesser extent, They Came From Verminest. This is a "mini" version of Disc Gunship. The full version, I intend to include in the GDC 2012-in-One Kart. 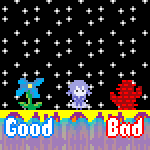 This is nonetheless intended to stand by itself, for those who might prefer a slightly more minimal version of the full game. Use the space bar to shoot fire and score points. The fire will then bounce around the room- don't get hit by it or you will lose a life! You will get another life every 5 seconds survived. Every once in a while (varies by difficulty) a powerup will fly by allowing you to freeze the fire in place.